Curatorial description: In 1871 Archibald Burns was appointed by the Edinburgh Improvement Trust to document buildings in the area between the Cowgate and the University’s Old College, which were to be demolished that same year as part of a slum clearance programme. 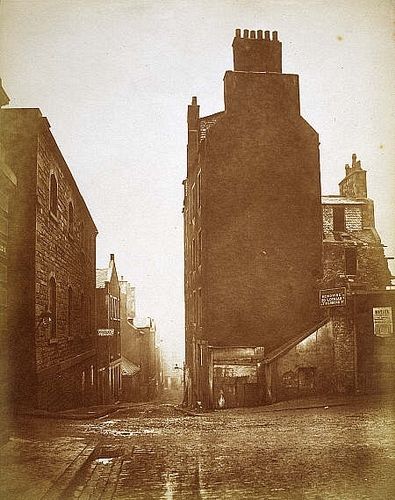 Burns took his photographs after the buildings had been cleared in February 1871, which explains the many removal and relocating signs. The resulting series captures perfectly the desolation and melancholy of the derelict area. The effect is heightened by his use of the then old-fashioned salted paper process, which gives the photographs an air of nostalgia. The Horse Wynd is now a set of steps rather than a street; it runs from the Cowgate at its present junction with Guthrie Street up in a straight line to present day Chambers Street.